Drawings and text copyright © by John Northall. The Royal Commission into Ancient Monuments in Wales. 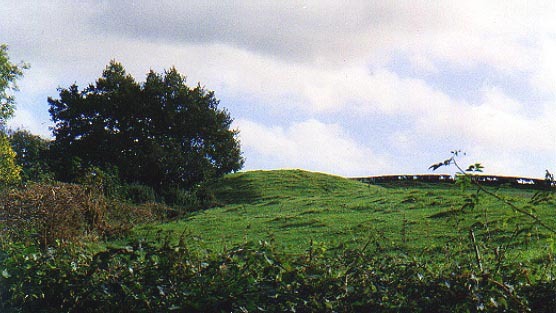 Above: The western end of the earthwork forms a low motte. There is a steep drop down to a road to the left with a gentler slope towards a stream to the right. Brynffanigl is situated in a fertile secluded valley a few miles south of the North Wales coast at Abergele. 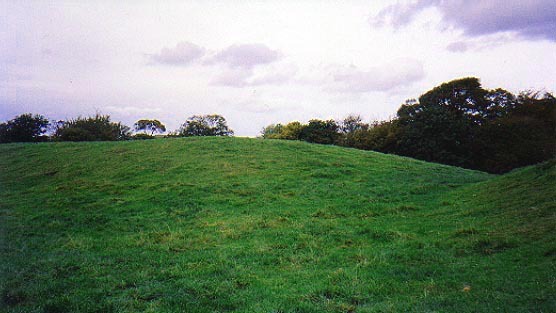 The small earthwork that still exists there appears to have been the site of a simple earthwork castle. The Clwyd Powys Archaeological Trust have carried out a field survey here and believe it was the home base of a medieval Welsh lord called Ednyfed Fychan. 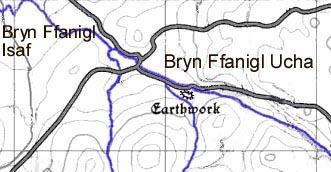 The local volume of the Royal Commission into Ancient Monuments in Wales states that Ednyfed styled himself "Lord of Brynffanigl". Ednyfed inherited Brynffanigl from his father Cynwrig (Kendrig) and went on to aquire several estates in North Wales during his long service to Prince Llewelyn the Great, including Bryn Euryn in Rhos Fychan and Penmynydd in Anglesey. His royal duties were Steward, Chief Counsellor, Chief Justice, General and Chancellor but not all at the same time! Ednyfed married twice, first to Tangwystyl Goch of Rhos and then to Gwenllian, a daughter of The Lord Rhys. He had a total of 12 children and died in 1246 having lived to be at least 72 years of age. His descendants continued to serve the Welsh monarchy until shrewdly switching sides to King Edward the First just in time for his final subjugation of Gwynedd in 1282. The Tudor dynasty sprang from the Anglesey branch of Ednyfed's family, leading to Henry VII, Henry VIII and Elizabeth I, and eventually an American president. The castle is not strongly sited as it lies within a valley and it may have been a fortified taxation point as opposed to a strategic stronghold. The Welsh lords made much of their money by taxing the movement of goods and animals and small castles, often without baileys, were possibly used as secure tax enforcement bases. There are numerous small Welsh castles situated beside ancient roads, not always on high ground (for example, Ewloe is directly overlooked by the adjacent ridge). Brynffanigl is close to a crossroads directly overlooking a road running down the valley and Ednyfed may have used the castle to regulate entry into his lands. The photograph above shows the ditch at the eastern end of the earthwork. The enclosure lies to the left of the ditch. The castle consisted of a narrow triangular earthen platform on the tip of an inland promontory formed by two converging streams, and as such was similar to Newcastle Emlyn. The platform was cut off from the adjoining promontory land by a ditch at the base of the triangle. The ground falls away to a lower level on the other two sides of the triangle and no ditches were provided there. A strong wooden rampart would have been provided around the edge of the platform, perhaps with wooden towers. Domestic buildings would have sited been within the defended enclosure.